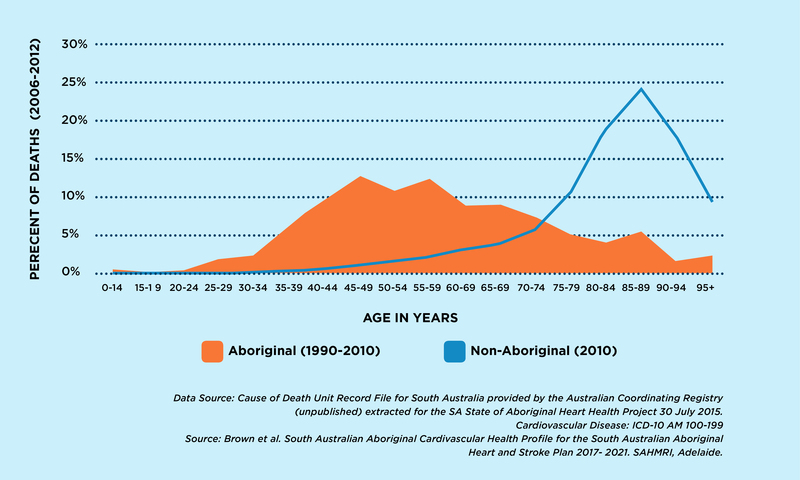 Heart disease and stroke (also known as cardiovascular disease) is the single largest cause of death for Aboriginal people in South Australia, accounting for 1 in 4 deaths. It is the single largest contributor to the life expectancy gap experienced by Aboriginal people. Importantly, the deaths occur at a much younger age than non-Aboriginal people, however many of these deaths are preventable. The majority of Aboriginal people who pass away from heart disease and stroke do so between the ages of 40 and 70. The loss of so many people at such young ages has repercussions for the social infrastructure and cultural capital of Aboriginal communities. It is important for communities to understand what are the things which contribute to heart disease and stroke, and what are the things people can do to prevent them from getting sick. It is important for community to understand what are warning signs of heart and stroke problems. 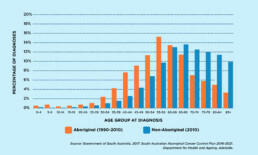 Aboriginal people in South Australia are diagnosed with cancer at significantly younger ages compared to the non-Aboriginal population. More than half of diagnoses occur before the age of 60, compared to less than one in three of diagnoses in the non-Aboriginal population. Aboriginal people are also more likely to be diagnosed with cancer at a later stage and, as a result, have worse outcomes. 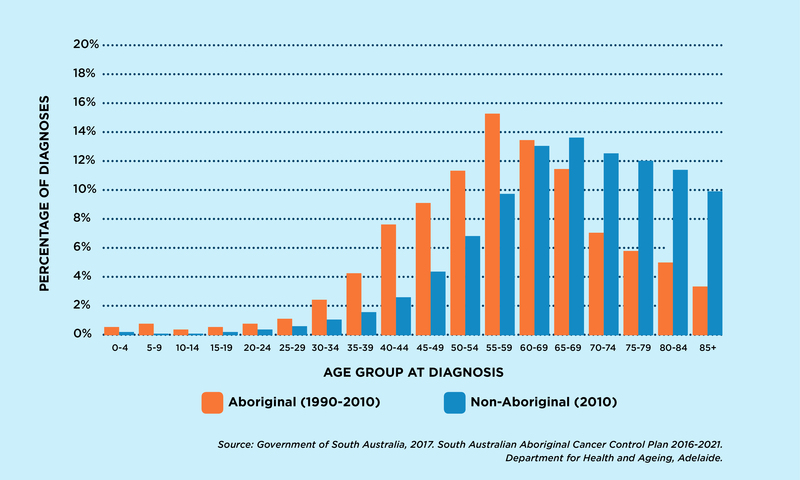 Within each stage, Aboriginal people in SA consistently experience lower cancer survival over 5 years, regardless of the degree of spread of cancer when diagnosed. Many of these cancers can be detected early through regular health checkups and screening. When cancer is detected earlier, people have a greater chance of returning to a healthy life. Prevention and screening programs should focus on targeting the specific needs of the community in a culturally acceptable way. Aboriginal people in South Australia are more likely to be diagnosed with: upper gastrointestinal, head and neck, respiratory, gynaecological and thyroid and other endocrine cancers, compared to non-Aboriginal people. Importantly, Aboriginal people are less likely to be diagnosed with breast, colorectal, skin and urogenital cancers but still suffer an unacceptable burden and have low screening rates. 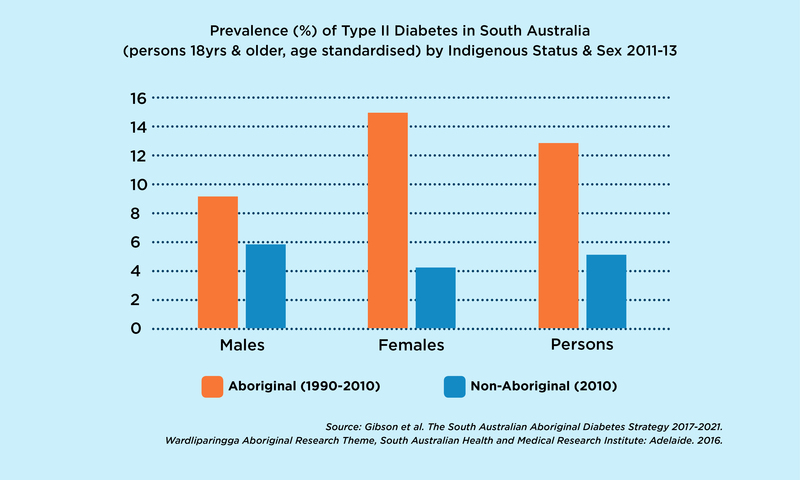 Diabetes is a leading cause of disability and premature death for Aboriginal people in South Australia. 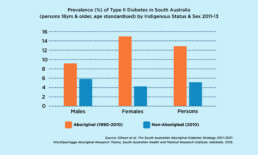 Aboriginal people in South Australia experience much higher rates of diabetes (types 1, 2 and gestational), with one in five people having diabetes, compared to one in every 16 non-Aboriginal people. Diabetes can be prevented. Not every Aboriginal person will get diabetes. We need to help communities to understand what we need to do to slow down or stop diabetes. Reducing the impact of diabetes is a priority of Aboriginal communities and health organisations. Diabetes effects all of the body, not just a person’s sugar levels. Diabetes can contribute to people experiencing heart attacks, kidney and eye problems if left not treated, as well as blood flow around the body, resulting in amputations of limbs. It is important that our communities understand this and can reduce the risks of problems from diabetes. 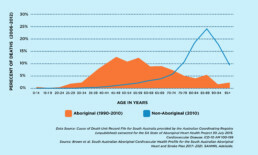 Aboriginal people aged 25 and over are hospitalised for diabetes at significantly greater rates in South Australia compared to non-Aboriginal people. In the two most recent years of available data, hospitalisation rates have increased.